Steam pressure washers are very effective for tough cleaning jobs. They can be used in the home or business. There are a number of models available to meet your needs. The advantage of using one of these machines is cold water systems will tend to harden grease and oil build-ups making them even harder to clean. Steam, on the other hand, will break up the oil and grease and make cleaning easy. Mechanic shops: Stubborn grease and grime is hard to clean. You will find these types of stains hard to remove with cold water systems and even difficult with hot water ones. However, steam systems can be very effective. Home garages and other concrete floors: Tough stains are easier to clean with a steam system. This is because the steam in these machines can be heated up to 330 degrees F. Steam pressure washer can effectively break up even the toughest stains. Restaurants: These are areas where you can get a lot of grease build-up and hardened stains. A steam system can take care of these tough cleaning jobs. It is very important to know that unlike other washers, the steam nozzle should be kept only about 8 inches from the surface to be cleaned to be effective. Sidewalks and areas around your business: Sometimes you will find tough stains like chewing gum around your premises. Steam pressure washers are ideal for this type of cleaning as it requires less moisture. The high steam temperature will literally melt off the gum. First, remove the loose debris from the area to be cleaned. You can do this by sweeping or vacuuming the area. Secondly, fill the tank of the machine and allow it time to heat. You will not have to add chemicals as the heat of the steam should be able to do the cleaning job. Next, choose the right steam nozzles and move the Steam pressure washers over the area to be cleaned. The dirt will be lifted out of the carpet or from the surface. Vacuum the carpet with a wet vacuum, or sweep the surface to get rid of the loosened debris. Safety tips: It is very important to read the manual carefully and understand the safety rules when dealing with this kind of equipment. If chemicals are used it is wise to wear a mask to protect you from inhaling fumes. Wear protective clothing when using steam pressure washers because you are dealing with very hot steam. You should wear a heavy raincoat and working gloves. You might consider duct taping your gloves to your raincoat sleeves to prevent moisture from seeping in. To avoid malfunctions in the machinery be sure to check the machine carefully before you use it. Malfunctions can cause serious injuries so it is best to be cautious to prevent any accidents with these Steam pressure washers. How can Steam Pressure Washing benefit you? 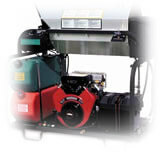 Learn more about Pressure Washers Power so that you can choose the one that is right for you.